It’s a crisp, still morning in southwest Montana. The sun is up but not making much of a dent in the sub-zero temperatures. In short, it’s a perfect morning for duck hunting. Clouds of steam and fog hang over the warm springs, marking likely spots where mallard ducks, those hardy, wary and, fortunately for hunters, delicious birds come in at night seeking warmth and open water after a day of feeding on area grain fields. It’s a dry winter, so far, so the fields are mostly brown. The rushes and brush along the springs and creeks are, however, a brilliant white from hoarfrost, sparkling in the morning sun. 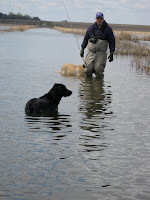 Flicka, my black Labrador retriever, and I are approaching a warm spring pond where I’m hoping ducks are enjoying the balmy microclimate of warm air hanging over the steaming pond. We’d made another approach on a nearby creek earlier. Hundreds of mallards were in that creek, though were flushing out, far ahead. Cattle and sheep in the field were moving nervously, and the ducks took their cue from the livestock. Still, there were ducks that stayed tight until we got in shooting range and I managed to make a rare double on the flush, dropping a pair of mallards. The ducks were on the pond, not disturbed by those earlier gun shots, and when we came close, the air filled with ducks, their green heads and blue wing markings shimmering in the sun. I have a sorry record when it comes to shooting when there are a lot of birds in the air and this was no exception. I emptied my gun and the birds flew away unharmed. I thought I had picked out individual greenhead mallard drakes, but, if results are a true indicator, my focus was evidently on the flock. That’s how the morning went. I made a couple more sneaks on other ranches and on one walk, I dropped a duck with my first shot but when I looked for another mallard drake, the rest of the birds were already out of range. On yet another sneak, I again came in just right, and, again, filled the air with shot without positive results. I suppose I could have gone home that day feeling frustrated about the whole business, but I couldn’t help smiling. If my shooting lacked accuracy, it wasn’t that big a deal. I still went home with three prime mallard ducks, and after I’d finished plucking feathers from three ducks I felt no need to pluck more. Moreover, from the perspective of whether this was a successful hunt, it was one of those days when almost everything went right. 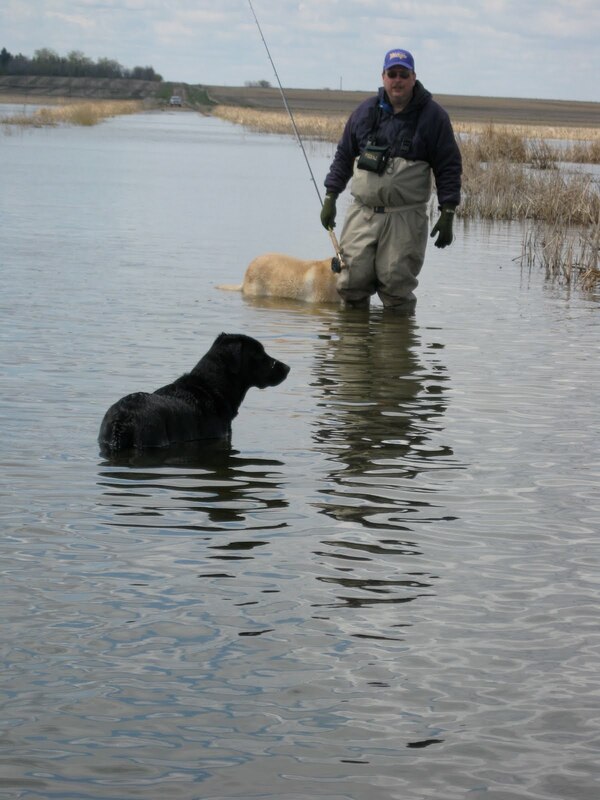 The cold weather concentrated the ducks on the little warm-water spring creeks and my hunting strategies put me in shooting range when the ducks flushed, and Flicka was elated to be able to make a few more retrieves before we came to the end of the season. The waterfowl season, the last of the general hunting seasons, is now over, marking the end of almost five months of hunting, starting with chasing blue grouse in early September, moving on to ruffed grouse, pheasants, deer, and waterfowl. Flicka and I have walked mountainsides, wetlands and prairies from western Montana to western North Dakota and back again. We’ve had hunting thrills, along with a moment of sheer terror when Flicka got in the path of a car back in November. Yet, here we are in January, finishing up the waterfowl season with a flourish. In short, I’m content. I’m hoping for a lot of new snow for skiing. It’s time to do some flytying, and to get going on a rod rehabilitation project. I want to try some new recipes for cooking wild game. The days are getting longer and on some mild afternoons I’ll probably sneak out for some flyfishing. Maybe I’ll try to organize a spring turkey hunt, but in any event the next hunting season is just over eight months away. We’ll figure out something to do while we wait for September.